Exquisite star shaped Aurora Borealis crystal with celestial mini stars in the center. 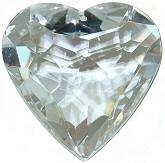 The back is beautifully faceted to a raised center point enhancing the rainbow reflections. A superb Feng Shui crystal that increases the energy flow and light play in the room. 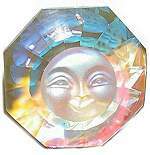 Absolutely stunning frosted rainbow celestial Sun Face Prism with faceted sides. The back is beautifully faceted to a raised center point enhancing the rainbow reflections. A superb Feng Shui crystal to enhance the energy flow and light play. Gorgeous 30mm clear faceted ball with 10 Aurora Borealis faceted crystal "leaves" and hanging filament, creates a masterpiece of subtle rainbow reflections. Guaranteed to please!! If you buy this as a gift you'll find it hard to give away. A superb Feng Shui crystal to enhance the energy flow and light play. The Preciosa star cluster has 8 long faceted points and 8 smaller tear drop facets for a total cluster of 16 prisms to fabulously reflect the light. Use as a window ornament anytime or for the Christmas festivities. Available in Aurora Borealis finish or Clear. Presented in a beautiful Preciosa gift box. 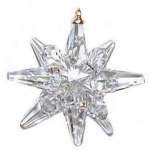 Faceted Preciosa Crystal tear drops form this amazing 12-pointed star with gold toned bail. This is a great Christmas ornament or use as a decorative hanging prism. A superb Feng Shui crystal to enhance the energy flow and light play. Available in Aurora Borealis finish only, the Clear is sold out. These gorgeous Emerald Shamrock 40mm Prisms or crystal pendants are perfect for celebrating Irish fever and make fabulous party favors! Frosted celestial Sun Face Prism with exquisite faceted fluted edge, accented by a colorful border reflecting either gold or red rainbow hues. The back is flat and offers another captivating view. A superb Feng Shui crystal to enhance the energy flow and light play. 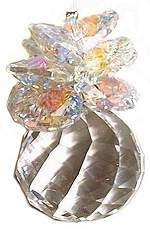 Dazzling Rose Aurora Borealis angle faceted Lattice 4-pointed Star prism. Soft lovely rainbow reflections in pink and green to add luster to your day. A superb Feng Shui crystal to enhance the energy flow and light play.